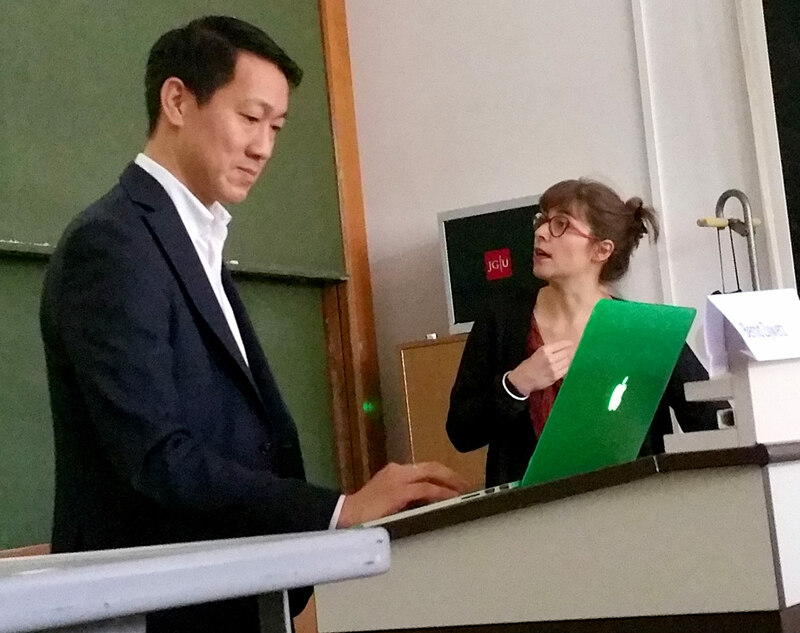 As part as our international conference „Jihadi Audiovisualities: Meanings, Aesthetics, Appropriations“ Chloé Galibert-Laîné, Kevin B. Lee (s. picture above) and I hosted a workshop at the University of Mainz on October 5, 2018. Titled „Media (Text) Rhetoric and Video Essays: Dealing analytically and creatively with ISIS videos“ we discussed, well, how you could analyze propaganda videos (especially of the so-called „Islamic State“) as a form of persuasive media text and how could video essays be a considered as appropriate „tool“, „method“ or „art form“: for expression and exploration, for distancing and countering as much as for coming to terms with extremists often explicit images. In my presentation I mentioned (and recommended) several videos, texts and tools which I would like to share/link here. First, when it comes to film rhetoric, an approach quite useful for propaganda videos, Gesche Joost book „Film-Sprache: Die audiovisulle Rhetorik des Film“ (Bielfeld: Transcript, 2008) is a valuable source not only for the theoretical considerations (especially about updating classical rhetoric in and for modern multimedia times). As the title suggests, it’s in German. An English paper, however, addresses central thoughts and presents some examples like a list of tropes. It is available (as PDF-File) from Sheffield Hallam University Research Archive (SHURA): Audio-visual Rhetoric: Visualizing the Pattern Language of Film (by Gesche Joost, Sandra Buchmüller und Roman Englert). Another approach mentioned was Multimodality and – within this framework – Rhetorical Structure Theory (RST). As I referred und draw mostly on the work of John A. Bateman I recommend the introductory textbook „Multimodality: Foundations, Research and Analysis“ by Bateman, Janina Wildfeuer and Tuomo Hiippala, published in 2017. A German version is announced. RST is extensively featured in Bateman’s book „Multimodality and Genre“ – together with the Tiger document. For both see also „A Model of Genre in Document Layout“, a paper by Judy Delin, Bateman and Patrick Allen. As mentioned in the our workshop, RST was first introduced by William C. Mann and Sandra A. Thompson. One of their first papers you find HERE, the RST Website, where many resources are pooled and especially a very useful introduction into (and overview of) the rhetorical relations is presented HERE. One short (and low-priced) but highly valuable ebook is recommendable: Published by Christian Keathley and Jason Mittel: The Videographic Essay: Criticism in Sound & Image (Montreal: Caboose, 2016) features interviews and insight from Eric Faden, Catherine Grant and Kevin B. Lee – but also by the both editors Keathley and Mittell, who talk about there on university workshop on video essay production and offer practical ideas for your own work. Kevin’s essay: „The Spielberg Face“. Another one I can recommend is rather „meta“ – as it is concerned about „What Makes a Video Essay Great?„. Jenny Zimmermanns video essay, comparing the use of children in ISIS and human aid / human rights institutions and organizations like UNICEF or Amnesty International, can be found here on my own Online-Propagandaforschung-Vimeo account.
. Use VLC media player to take batch screenshots for a static comprehensive view to e.g. detect visual patterns, dramatic and narrative structures. A How-to Guide HERE on TurboFuture.
. Two easy to use and free tools for graphical annotation (to „draw“ in video screenshots, to save & share the results) for discussions or collaborative analytical work: Pointofix (English language pack available) and Greenshot.